I am excited to announce the launch of my new line of FireFly Rings: Modern Metals. In this launch, I feature a variety of styles including Mokume-gane, anodized fusion cobalt and black zirconium, and Damascus steel with titanium blends. Founded primarily to cater to customers who want to supplement their wood ring with an all-metal ring, Firefly Rings has found success simply by offering unique products made with the same, top-quality materials found in major jewelry stores at a fraction of the price. I am able to do this for two reasons: WedgeWood Rings establishes productive relationships with major jewelers and access to wholesale pricing; second, this is not a primary business venture. In recent months, I have been inspired to create a wider selection of all-metal styles to cater to clients who prefer a traditional metal wedding ring, but still want something completely unique and durable. Titanium is a modern metal that has become an increasingly popular wedding band choice for those with metal allergies. It is completely hypoallergenic and biocompatible. It is fairly scratch resistant, earning a 950MPa on the Vickers Hardness Test scale. It is also resistant to corrosion or tarnish- even in salt water! It is very lightweight and, if you choose a satin finish, doesn't give off much of a shine, making it a comfortable fit for those who don't normally wear jewelry, or don't like anything too flashy. The Mokume Titanium line of rings features a unique blend of titanium alloys which are combined much the same way damascus steel is made. They are then “etched” using high heat, creating unique patterns. Cobalt is the most scratch resistant and shatterproof modern metal I offer. It is similar to white gold or platinum in appearance, but is about four times harder than platinum, with an MPa of 1043 on the hardness scale. Similar to titanium, it is hypoallergenic and biocompatible. However, in many circumstances under which a titanium ring might scratch, cobalt will not. 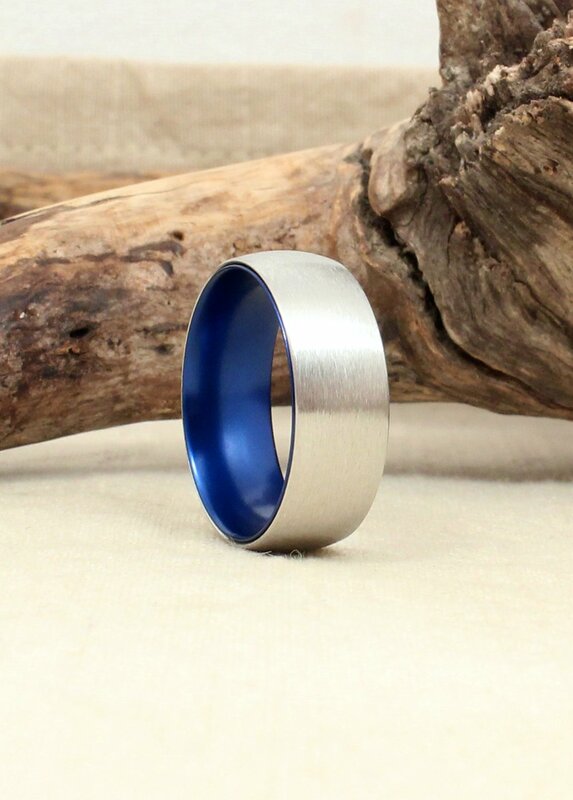 In my new line of cobalt wedding rings, the interior is lined with anodized aluminum. The bond between these metals is permanent. Aside from the obvious and intentional difference in appearance, the bond is seamless. 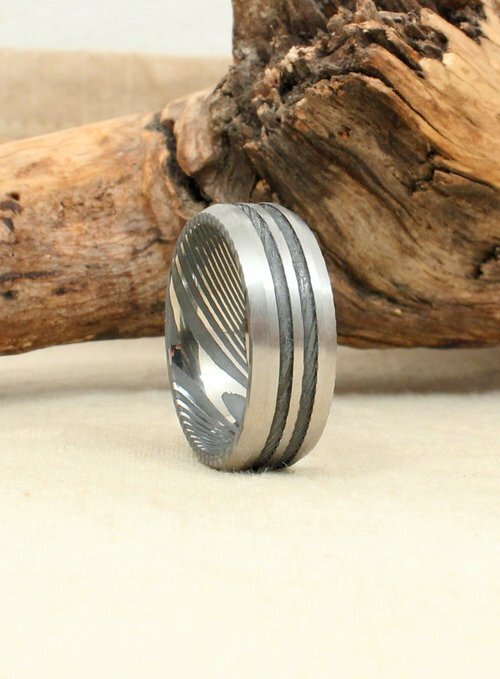 Damascus steel is incredibly scratch resistant and heavier, making it a modern metal wedding ring ideal for tougher lifestyles. Damascus is made from many layers to create a stronger, superior metal. Throughout history and fantasy, this was the preferred choice for superior weapons- nothing says manly like blade steel. If the word “steel” makes you nervous for fear of it rusting- not to worry. The natural oils in the skin as well as the quality steel alloys used in these rings actually make it as rust resistant as possible for any stainless steel ring. The hand wrought damascus featured in my new line is unique because it is similar to fingerprints- no two rings are ever alike. Philosophically, I have always been averse to producing all-metal wedding rings. They have always seemed so plain and without personality, the extra touches I have strived to add though the integration of wood into every WedgeWood Rings design. Until now. I have always been hesitant about offering gold wedding rings. The reason for this is because of the durability, environmental impact, and value of gold. To read more about my hesitation on working with gold, read my blog post here (insert gold article). However, as gold is a commonly requested material by my clients, I have come up with unique designs that are an intersection of old and the new; the contemporary and the traditional; the conservative and the adventurous. Modern, durable materials are mated with a precious metal base with proprietary techniques to create something equal parts fresh and timeless. Probably my favorite of the modern metal release, are the precious metal mokume-gane rings. Mokume Gane "wood grain metal" is a technique that originated in Japan in the 17th century. Originally a technique for folding and fusing metals for swords, it is now almost exclusively in the province of the jeweler. Each ring is individually handmade for the customer. Because of the higher grade materials used for a more durable ring, the process is both absurdly time-consuming and expensive. Frankly, I wouldn't offer this style ring, except the results are so undeniably exquisite. Black ceramic is an ideal wedding ring choice for electricians as it is non-conductive. It is extremely durable and scratch resistance, with a 2035MPa on the Hardness scale, making it more durable than any metal except tungsten carbide. Unlike the black zirconium, the black ceramic color is not coated- that is to say it is black through and through. Should it get scratched (which is very unlikely), it will not reveal a different color underneath. This makes it a good choice for those who are more likely to scratch phone surfaces, watch faces, etc, but also like the black coloring. Tungsten Carbide, with an incredible 2600MPa on the hardness scale, is one of the most sought after modern metals if you value its unparalleled scratch resistance. Because it is 10x harder than gold, and 5x harder than steel, it will not bend or deform in any way. Because of its density, however, it makes it heavier. MUCH heavier than titanium, for example. One factor to consider when shopping for a tungsten carbide wedding ring is the relationship between hardness and brittleness. As with all superhard materials, a tungsten carbide ring, if it is dropped from head height onto concrete, has a chance to crack. All rings in my shop are made using only US sourced materials, so the tungsten carbide I use does not crack easily as do mass-produced made-in-China, poorly casted rings.